I love the clearance aisle. It’s my little slice of grocery store heaven. Regardless of the fact that I’m a grocery list nazi, you can still bet it’s the first place I’m gonna go and I don’t care if it’s on the list or not. If it’s on clearance, we make exceptions. The sons know. “Mom’s got a grocery cart? Aww, snap! Do NOT get between her and the clearance aisle.” I wouldn’t really run them over. The sons like our grocery store’s clearance aisle as much as I do because there’s always some sort of candy on clearance. Since we try really hard to stick to our one day a month stock-up, everybody usually gets $1-2 to spend on an item of their choice, and they always gets a quarter soda on the way out. Well, except for the time the machine was completely out of stock, but that’s a temper tantrum of epic proportions story for another day. Anywho, back to the clearance aisle. Clearance. Candy. What kid wouldn’t dig that? As much as they dig it, I usually find something that I plan to incorporate into some re-vamped recipe. Most recently, it was several boxes of Nestle’s Buncha Crunch candies marked down to 25 cents a box. The wheels were turning guys! I knew they could be used to make some recipe magic. By now ya’ll know how much we like to shake things up. Well today we’ve brought our latest change-up to share. 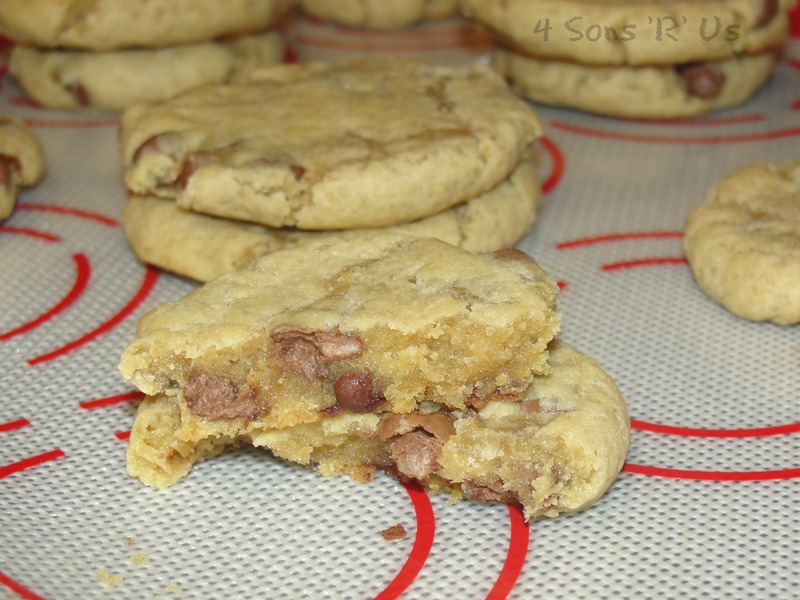 A new take on the traditional chocolate chip cookies. And they’re pretty friggin’ delicious if I do say so myself. We love cookies with mix-ins and have used m & m’s, Reese’s Pieces, and even Peanut Butter cups in the past, but using Buncha Crunch pieces was just genius. The great thing about using these candy pieces instead of chocolate chips? 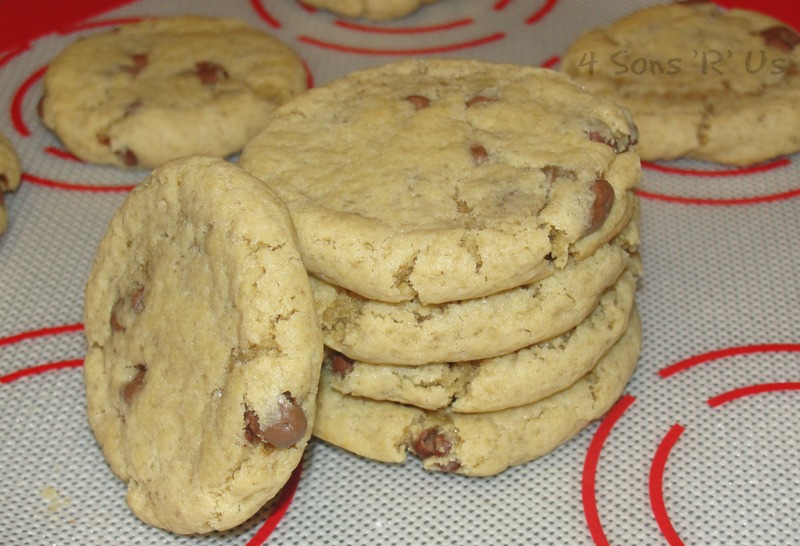 The chocolate doesn’t melt down when you bake them, leaving them intact with a tasty crunch! 1. In the bowl of a stand mixer, cream the butter and sugars together. 2. Add in the eggs and vanilla and beat until everything is evenly combined. 3. Add in the flour, baking soda, and salt and beat until well incorporated. 4. Use a sturdy spatula to gently stir in the candy pieces until evenly distributed throughout the dough. 5. Bake at 350 degrees for 10-12 minutes. I like your list nazi attitude! Need to develop one here. I often go without list and after 10 minutes, my brain shuts down. Too much to take in with just 2 eyes. Argh! On the cookie note, one heck of a cookie that is! Loaded with butter love ;). Welcome to Ff54 and hope you are having fun ? I love candy in cookies, it’s like double the treat! These look great!